TimeZone : Public Forum » This or That results. Picked Up today. Last week I posted that I was torn between a PP Aquanaut 5167 an an FPJ Chronometre Bleu. The responses were split down the middle, but I recieved many great insights and observations. Thanks. My head said Aquanaut but my heart said FPJ. My heart won... But I was still unable to pull the trigger on the CB for some reason. I ended up with a simple classic Chronomtre Souverain, but with the black Boutique dial. My first Rose gold watch, and probably my dressiest piece. 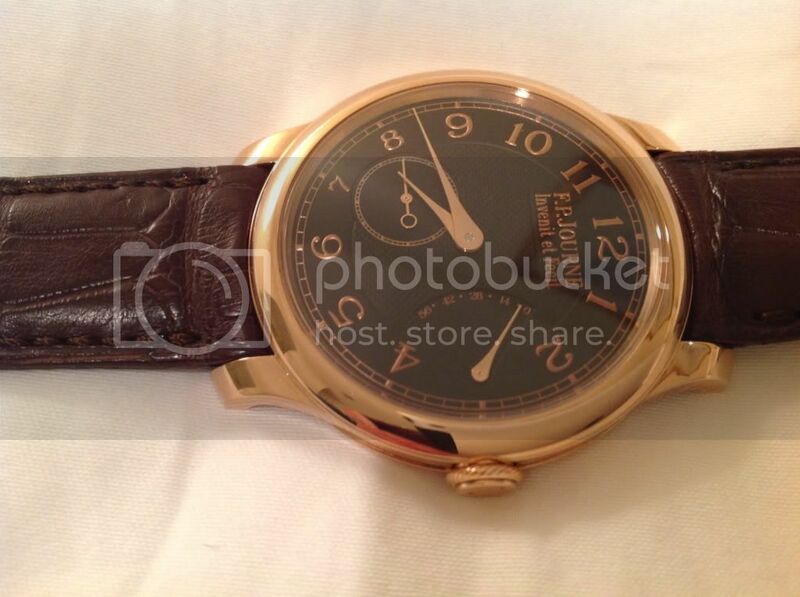 I fell for the rose gold numerals on the black dial like a ton of bricks. I wish I could capture it better. It came on a chocolate gator strap; long term I'll probably put it on a black strap but for now I like it. I need a brown strap dress watch. Anyway, thanks for weighing in last week. I'm a happy guy tonight.